Hobey21	 10-01-2015 10-09-2015 Success 8 0/1 Sent me a signed color 8x10! Great success from a great golfer! Thanks Ian! 8 Days! wongcastle	 04-13-2015 04-20-2015 Success 7 0/1 received signed color 8x10 (NOTE: I have not been requesting another picture every week - I believe that they are misreading my thank you e-mails. teetime354	 04-02-2015 04-11-2015 Success 9 0/2 Sent email request. Received 2 signed 8x10 promotional pictures in black sharpie. Both appear to be real. eaglesrock55	 03-15-2015 03-23-2015 Success 8 0/1 Awesome autographed picture!! primetime27	 01-09-2015 01-14-2015 Success 5 0/1 01 15 15 Received a signed color 4 x 6 picture. torrebroncos14	 07-14-2014 07-18-2014 Success 4 0/1 Thanks! 4 Days! arobertson	 05-06-2014 05-09-2014 Success 3 0/1 Wow. Came in 3 days from the UK. Got a signed 4x6. 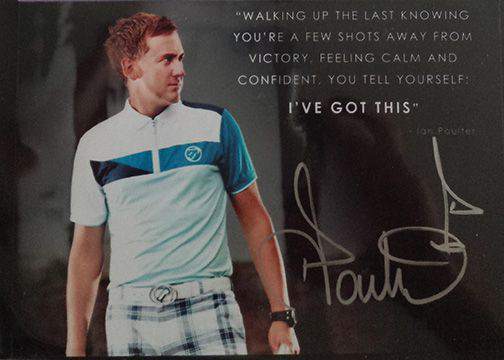 Thanks Mr Poulter!! JoeWeb10	 04-15-2014 04-21-2014 Success 6 0/1 Autograph was VERY smeared. Not complainign though! Hope to get him IP at the Tour Championship! lautnerfied	 02-20-2014 02-28-2014 Success 8 0/1 Feb 20th Sent Request. Feb 21 got Email saying it would be sent. Feb 28th got it. primetime27	 12-26-2012 02-07-2014 Success 408 0/1 Sent request on website also. 10/27/12 Answered do not see Ian very often and cannot send out. 01/27/14 Sent another request. 02/03/14 received response that this will be sent. 02/07/14 Received a signed color 4 x 6 picture.